Msgr. William J. Lynn is back in jail. He won't be seeing the Pope when he comes to town next month. Meanwhile, Thomas A. Bergstrom, the monsignor's longtime defense lawyer, is back in state Superior Court, arguing that his client deserves to get out of jail or be granted a new trial. Bergstrom is operating on friendly turf. On Dec. 26, 2013, a panel of three state Superior Court unanimously reversed Lynn's 2012 conviction on a single count of endangering the welfare of a child, and ordered that the monsignor be "discharged forthwith." But on April 27, four state Supreme Court justices reversed the Superior Court's reversal, setting off a chain of events that culminated with Lynn's return to jail on April 30th. The legal battle in the monsignor's case dwells on the wording of the state's original child endangerment law that said, "A parent, guardian or other person supervising the welfare of a child under 18 years of age commits an offense if he knowingly endangers the welfare of the child by violating a duty of care, protection or support." The Superior Court decided that under that statute, Lynn wasn't a supervisor. The state Supreme Court disagreed, saying that under the law, Lynn was a supervisor. "The Supreme Court's Opinion was remarkable for what it did and did not say," Bergstrom, along with lawyers David A. Schumacher and Allison Khaskelis, argued in a 10-page supplemental brief submitted June 30th. "While the 'Commonwealth urge[d] the [Supreme Court to reverse the Superior Court and reinstate [Lynn's] conviction . . . that is plainly not what the Supreme Court did," Bergstrom wrote. Instead, Bergstrom wrote, the state Supreme Court opinion turned on the narrow issue of whether under the law, Lynn, the Archdiocese of Philadelphia's former secretary for clergy, was a supervisor. "The majority [of the state Supreme Court] then held that [Lynn] could be classified as a supervisor," Bergstrom wrote. But the state Supreme Court "left the door entirely open regarding whether [Lynn] knowingly endangered the welfare of a child," Bergstrom wrote, referring to the wording of the rest of the original statute. In his brief, Bergstrom argues that the Commonwealth has "utterly failed to prove this element of the crime," namely whether Lynn knowingly endangered Billy Doe. The Superior Court has already agreed with Bergstrom on the issue. 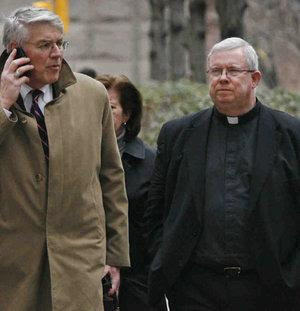 Bergstrom quoted the Superior Court's unanimous opinion of Dec. 26, 2013, "There was no evidence that [Lynn] had any specific knowledge that [former priest Edward] Avery was planning or preparing to molest children at St. Jerome's," the Superior Court panel of judges wrote. "Indeed, Avery was not even diagnosed with a mental impairment that suggested he had a predisposition to commit sexual offenses," the state Superior Court judges wrote. "As such, the notion that Avery was an ongoing, ever-present danger more than a decade after having sexually assaulted R.F. [a previous victim] was tenuous at best," the Superior Court judges wrote. "Here, the information available to [Lynn] only suggested Avery's acts of sexual abuse were a byproduct of his alcohol abuse, and there was no evidence that Avery had resumed drinking or that [Lynn] knew of such behavior." The Superior Court judges wrote that Lynn did not "know of" Billy Doe, "nor did he have any specific information that Avery intended or was preparing to molest [Billy Doe] or any other child at St. Jerome's," Bergstrom argued. Returning to the wording of the law, Bergstrom argued that the Commonwealth also did not prove that Lynn "owed a duty of care, protection or support" to Billy Doe. In conclusion, Bergstrom asks the Court for relief "in the form of immediate reversal or, in the alternative, a new trial." In response, the district attorney's office yesterday filed a 32-page response brief that says that Lynn "was a person supervising the welfare of many children, because as a high-ranking official in the Archdiocese of Philadelphia, he was specifically responsible for protecting children from sexually abusive priests." The D.A. wrote that prosecutors in the case "introduced extensive evidence that [Lynn's] handling of Rev. Avery's case was not an anomaly, but was in accord with his established practice for dealing with sexually abusive priests." "The evidence demonstrated that [Lynn] violated his duty to prevent priests from sexually molesting children . . . in furtherance of his objective to conceal the misconduct and to protect instead the reputation of the Archdiocese," the district attorney wrote. "Simply put, [Lynn] did not safeguard the physical and moral welfare of [Billy Doe] by placing Rev. Avery, a known child molester, in a position to molest him," the district attorney wrote. "For all his legal gyrations, it was precisely this conduct that brought [Lynn] within the class of individuals subject to criminal liability for EWOC," the district attorney wrote, referring to the crime of endangering the welfare of a child. "By his own concession, [Lynn] supervised the welfare of the children of the Archdiocese, including [Billy Doe], and knowingly endangered [Billy Doe]'s welfare by placing Rev. Avery in a location and situation that gave him license to abuse [Billy Doe]," the district attorney wrote. Whgile Bergstrom argues that the test under the law should be whether Lynn knowingly endangered Billy Doe, the D.A. argues that "only knowledge of endangerment is required." The "knowledge of a particular result is not required, the district attorney wrote. So the prosecutors ask that the "judgments of sentence" be affirmed, and Lynn remain in jail, according to the response filed by Hugh J. Burns Jr., chief, of the D.A. 's appeal unit; Deputy District Attorney Ronald Eisenberg, First Assistant District Attorney Edward F. McCann Jr., and D.A. R. Seth Williams. On June 22, 2012, a jury in Common Pleas Court found Lynn guilty of a single charge of endangering the welfare of a child. He was the first Catholic administrator in the country to be sent to jail for not properly supervising predator priests. On July 24, 2012, Judge M. Teresa Sarmina sentenced Lynn to three to six years in prison. Lynn had served 18 months of his sentence on Dec. 26, 2013 when a panel of three state Superior Court judges -- John T. Bender, Christine L. Donohue and John L. Musmanno -- reversed the monsignor's conviction and ordered him "released forthwith." But Judge Sarmina didn't agree, and instead imposed conditions on the defendant that amounted to house arrest. As of yet, no date has been set for oral arguments in Superior Court before the same panel of three judges that previously reversed Lynn's conviction. House arrest is creditable to prison time as it was served under draconian principles ordered by Judge Sarmina. That included wearing an ankle monitor, not being allowed to sit outside the rectory for fresh air and having to call for permission to travel to see his lawyer, a doctor. Lynn has already completed more than 3 years of his sentence and is legally entitled to parole which should immediately be granted had Sarmina not ordered him put back to jail. If a new trial must be held, a new judge must be appointed to hold the trial and it must be held in a location outside Philadelphia, should we not be able to find a fair and impartial jury in Philadelphia. And once more, the trial must not be a repeat of the infamous 12 week trial with victims from decades past giving testimony on the abuse by priests but confined solely on the one count of child endangerment. In the 2012 trial, Sarmina refused to strike from the record testimony of abuse victims that had nothing to do with what Lynn was charged with as if he was solely responsible for cases that happened before he became a priest and before he was born. Since DA Seth Williams is obsessively pursuing this case with a sick sense of having to win something, it is time to take a look at his lack of fairness in judging this case against Lynn and it is time to petition for the immediate removal from office of Seth Williams along with the cadre of ADA's who helped him prosecute the case. A deal can be offered to let Seth finish out his term on condition that he drop further appeals ensuring at keeping Lynn in prison for things he did not do. Finally, it is time to file discipline complaints against both Judges Sarmina and Ceisler for their handling of the cases against priests and a teacher, including Lynn and Avery. Interesting that Sarmina was granted a transfer to civil court and Ceisler still remains on the bench in Common Pleas court. It is time to tell the best and brightest who are studying to become lawyers that this kind of judicial conduct by two judges is not considered acceptable when they were charged with the case and to ensure that justice was fairly served on the defendants. To have them running a kangaroo court here in the City of Brotherly love where our forefathers fought for our freedom and our civil rights during the Revolutionary War is embarrassing enough to make others think about third world countries who do such things. We deserve better and we should get better from those we elect to serve on the bench. The entire first paragraph is incorrect both factually and legally. Let them believe what they want to believe. They will wake up one day and the reality they are running away from will catch up to them and smack them right in the face. Factually accurate. House arrest is creditable toward prison time served only Judge Sarmina is not credible as a judge and not fit to sit on the bench, given what she did during the trial by slanting the deck fro the prosecution. House arrest or probation does not qualify as time served or considered to be part of a sentence of incarceration. The only thing that counts for jail time is actual jail time. Let me see if I have this correct, Msgr. Lynn should be held accountable because of his job of supervising children and also supervising priests. If that holds true than the Supreme Court should be held accountable for what went on in Traffic Court, they were ultimately the supervisors of judges and the public. The court was run in accordance with the established practice of dealing with moving violations, under the supervision of the Supreme Court, which was fully aware of the daily activities. Political payback time was running out . The Police Commissioner was the supervisor of the police and the citizens of Philadelphia, would he have been accountable if the officers were found guilty ? Lynn was tried and convicted of crimes committed by priests DECADES before he became a priest or was born. There could be an argument for convicting Lynn as a sacrificial lamb to protect the Archdiocese from being saddled with an unlimited statute of limitations for victims to file civil claims, true or not by the State Legislature. Very strange trial and the behavior of Judge Sarmina is even stranger because other judges would not have done what Sarmina did. Sarmina may well have committed career suicide and could not care less as she knows no top ranked Philly law firm wants her.